Aerodynamics: Why is it so hard to speed through the air? Atoms: How can you build a world from about 100 basic building blocks? Bullets: Why do they do so much damage? Candles: Why isn't the brightest part of the flame also the hottest? Careers in science: How to become a scientist. Center of gravity: What stops things falling over? Centrifuges: Can you spin water from your clothes or separate blood into its components? Chocolate: Can science explain why it tastes so good? Diagrams (how to draw): What's the best way to explain a machine with a picture? Electromagnetic spectrum: Light is only one type of electromagnetic wave—what are the others and why can't we see them? Electron microscopes: Can we really see things smaller than light itself? Endoscopes: How can doctors see inside someone without cutting their body open? Fireworks: How do chemical explosions light the sky with color? Forces and motion: Why do objects move in such predictable ways? Forensic science: How can science bring criminals to justice? Fresnel lenses: Why do lighthouses have those strange bullseye lenses? Fuel cells: Can we run cars on water and sunlight? Great physics experiments: What were the greatest physics experiments of all time? Happiness (science): What makes us happy or sad? Can science explain? Happiness (history): How have philosophers and scientists tried to explain happiness through the ages? Holograms: Can we really store 3D images inside pieces of plastic and glass? Inventors and inventions: What drives people to invent new things? What part does science play in inventing? Lasers: Where's the world's most powerful laser and what is it used for? Laser diodes: If lasers are so big, how come we use them in CD players and grocery store checkouts? Laser eye surgery: How can a blinding laser beam restore your sight? Lenses: Why does a curved piece of glass make it easier to see? Light: What is light and why does it do so many strange things? Luminescence: Why can things glow in the dark long after all the light has gone? Magnetism: What is magnetism and how can we put it to good use? Magnetrons: How can you generate microwaves in a radar or microwave oven? Materials science: Why is one material different from another? How can we design materials to solve particular engineering problems? Microscopes: How can they show us the tiny worlds within our own world? Mirrors: How does a mirror catch light and throw it back again? Linear motors: What happens if you unwrap an electric motor and lay it out flat? Nanotechnology: Can we build a new world from atoms and molecules? Photochromic lenses: How can a pair of eyeglasses darken in the light and lighten in the dark? Psychology: How do scientists use the tricks of science to study the human brain and behavior? Quantum dots: How does sound travel and why can't you hear anything in space? Science books: Do you like reading about science? Here are 10 of my favorite science books for you to track down! Sound: How does sound travel and why can't you hear anything in space? Soundproofing: What's the best way to block out your noisy neighbors? Space rockets: Why can a rocket travel in the vacuum of space? Space telescopes: Why can we see more with telescopes mounted in space? Sport: How can science make you a faster sprinter, a surer golfer, or a better soccer player? States of matter: Why are things either solid, liquid, or gas and why do they change back and forth? Suicide in young people: Can anything explain the high-suicide rates in adolescents? Superconductors: Will they give us floating trains and super-fast supercomputers? Surfing: What can science teach us about catching waves? Swimming: How can physics make you a better swimmer? 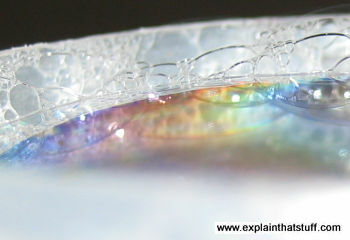 Thin-film interference: Why are soap bubbles amazing colors? Can we use that for anything? Wetsuits: How does a thin layer of artificial rubber keep you warm in the sea? Didn't find what you wanted? These are our general science articles. Browse the "More to explore" links below for our articles about electricity & electronics, energy, and more. For a full list of everything on the site, check out the A-Z index.